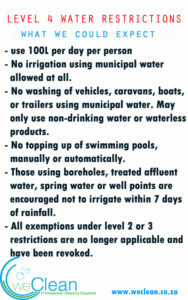 This is what to expect when level 4 water restrictions are implemented on the 1st of June 2017. The Western Cape water supply levels are very low. Theewaterskloof Dam is sitting at 14.37% Reading was posted at 18:00 on the 16th of May 2017. A link to the Facebook Post from the Facebook Group Water Shedding Western Cape. Residents of Cape Town need to do everything possible to #SaveWater. Make sure you have no leaks on your property, check your water meter to make sure that when everything is switched off, the meter is not running. Install water saving shower and tap heads. Flush the toilet with grey water instead of flushing with water that can be used for drinking. For those that can afford it, make plans to install rain water harvesting tanks.